To support the vehicle on safety stands, use the same support points as for a vehicle lift. Always use safety stands when working on or under any vehicle that is supported only by a jack. When lifting the front of the vehicle, set the parking brake. When lifting the rear of the vehicle, put the shift lever in reverse for manual transmission or in P for automatic transmission. 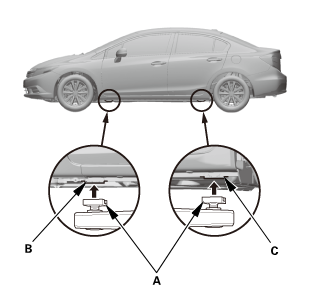 Position the floor jack under the front jacking bracket (A) or the rear jacking bracket (B). Center the jacking bracket on the jack lift platform (C), and jack up the vehicle high enough to fit the safety stands under it. Be sure the floor jack is properly placed to avoid damaging the vehicle. 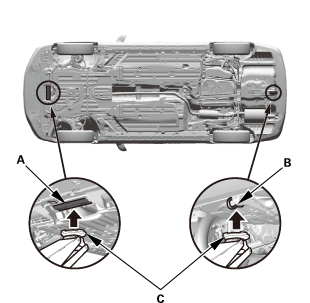 Position the safety stands under the support points, and adjust them so the vehicle is level side-to-side.